Without knowing about the weather and why it was changing, the people in the village of Jappineh in The Gambia’s Lower River Region would plant the same seeds in the same soil and hope for the best. When harvests increasingly failed, in an area where deforestation, raging bush fires, more severe river flooding and prolonged drought have degraded land and caused fertile topsoils to disappear, disappointed farmers becoming desperate to feed even their own families started giving up hope. The effect has been dozens of men, especially young men, downing their tools and leaving villages to search for jobs in the cities. Others risk their lives and all their family’s savings to get to Europe via Libya and send money home. But since climate change adaptation projects have started helping people understand the increasingly unpredictable weather and adjust their planting times and seed varieties, Dampha has seen fewer boys and young men abandon their fields, and their homes. “Over the last two years, they’ve started to realize that there might be opportunities here,” he says. Jappineh is one of 14 pilot villages that the Government of The Gambia, UN Environment and partners have supported with an early warning system project that started in 2014 with backing from the Global Environment Facility’s Least Developed Countries Fund. The early warning system has increased the quality of climate information by providing better forecasting equipment to 10 meteorological stations across the country, while improving access to information by supporting local radio stations and drama groups to share it with their communities. “We have learned about climate change and used the information to try and make sure we adapt–such as this garden,” says Dampha, standing in a solar-irrigated community garden where people grow vegetables to supplement less reliable, rain-fed grain crops. “Now, we can grow things all year round and also have a fund that we all contribute to and save up to buy things like solar panels and irrigation equipment,” he says. 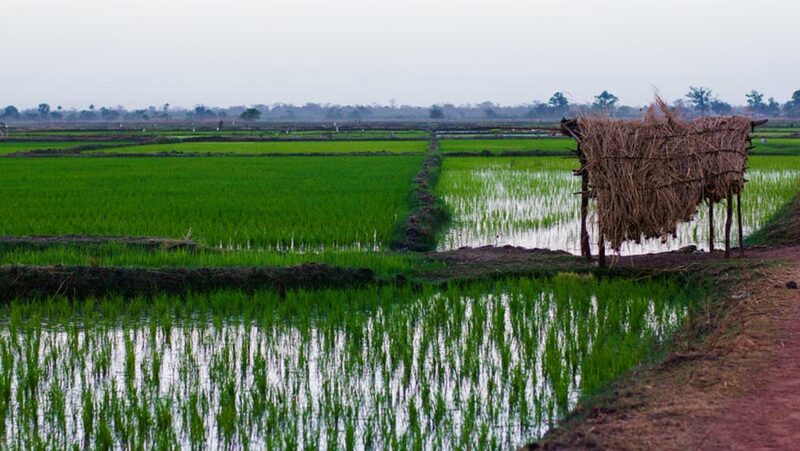 One of the world’s smallest and poorest nations, The Gambia relies heavily on agriculture for survival and is particularly vulnerable to climate change. Meteorologist George Gaye has charted the change in temperature and rainfall in The Gambia’s western region at a weather station in its capital Besse. “The rains are going down. If you compare the last 10 years, we have about 335 mm of erratic rains, and it used to be 400-500 mm” he says. Gaye has also watched average temperatures creep up by 5-10°C to around 45°C, alongside the catastrophic effect of changing weather patterns on communities, as cattle die in drought and people go hungry. “You can see the dryness. Everywhere is now dry, animals are not grazing and human beings are suffering. The water level has really gone down,” he says. Gaye is glad that the forecasts are more accurate and frequent thanks to UN Environment providing automatic equipment and supporting a mobile network to transmit live data to a central meteorological centre at the country’s main airport. To learn more about UN Environment’s work in climate change adaptation, please contact Jessica Troni: jessica.troni@unenvironment.org.